It was another red day in the markets with the Dow dropping 608.01 points or 2.41% and the S&P 500 dropping 84.59 points or 3.09%, which means that both indices are now down for the year. As someone who is warning about a dangerous stock market bubble (please watch my presentation to learn more), market behavior like this makes me very concerned. Even more concerning is the fact that the major U.S. stock indices have broken below their important uptrend lines that have formed in early-2016. These uptrend lines have guided the U.S. stock market higher for the past couple years during the phase of the stock market bubble that occurred after President Donald Trump won the election (hence why I call it the “#MAGA [‘Make America Great Again’] trendline.” The breakdown of this trendline signifies a very important change of trend. Today’s sell-off caused the S&P 500 to break below its uptrend line that began in early-2016. For further confirmation, I want to see if the index stays beneath this level by the close of trading on Friday. 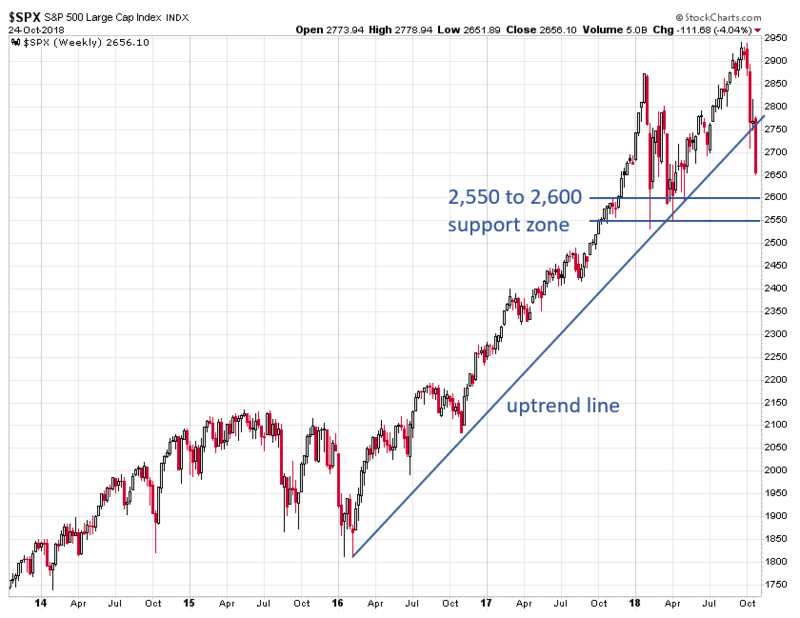 The next major technical support and price target to watch is the 2,550 to 2,600 support zone that formed at the lows earlier this year. Unlike the S&P 500, the Dow Jones Industrial Average has not yet broken below its key uptrend line. 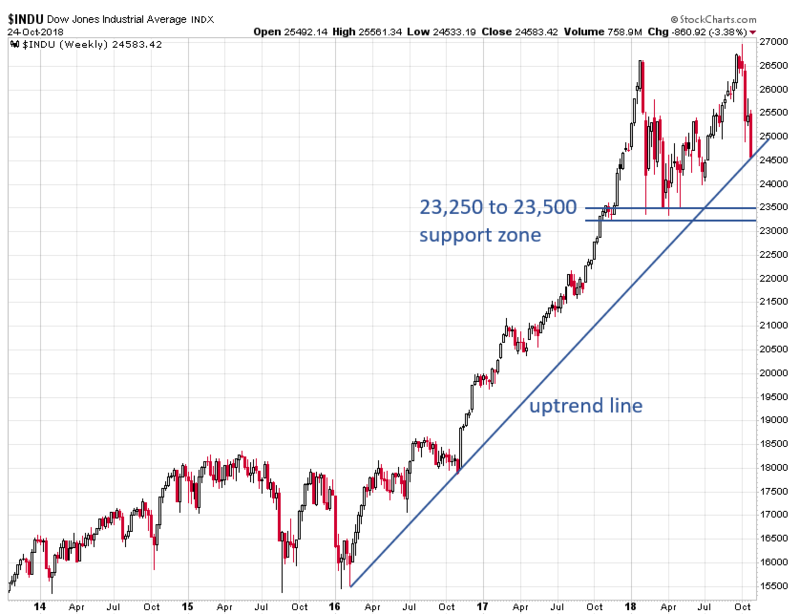 If the Dow closes below this uptrend line in a convincing manner on the weekly chart (possibly in the next couple days if the sell-off continues), the next important support level and price target to watch is the 23,250 to 23,500 zone that formed in early-2018. The Nasdaq Composite index broke below its #MAGA rally trendline for the first time today. 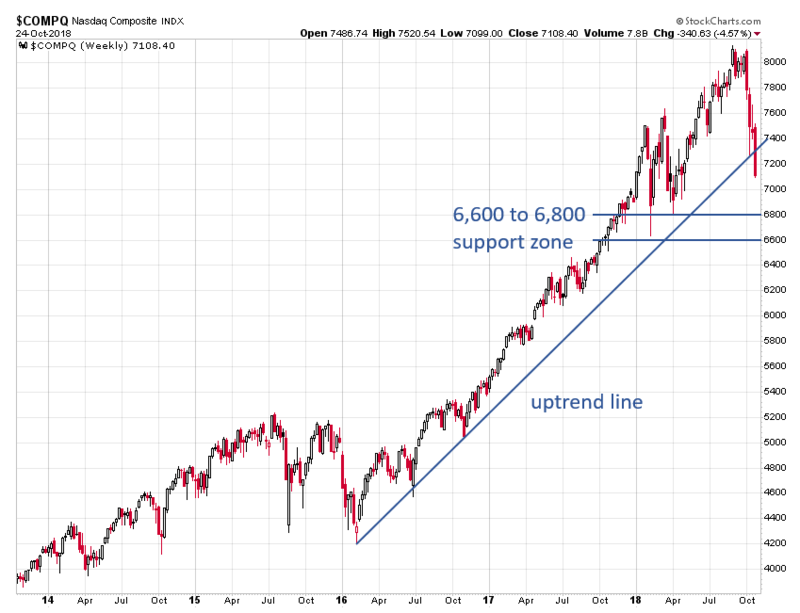 Assuming the index closes below this trendline by the end of trading on Friday, the next price target to watch is the 6,600 to 6,800 support zone that formed earlier this year. 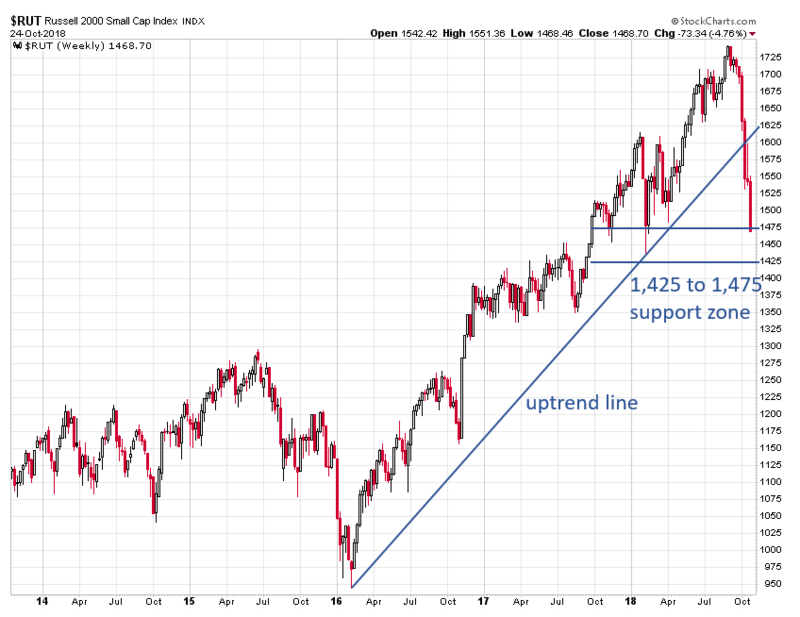 The small cap Russell 2000 index broke below its uptrend line two weeks ago and has hit the 1,425 to 1,475 support zone and price target that formed in late-2017 and early-2018. If the index breaks below this support zone, it would give another bearish signal. To put it simply, major trendline breakdowns like the one that occurred yesterday are not what you want to see if you’re a stock market bull. I want to see if the indices discussed are able to close at their current levels or below on a weekly basis by the end of trading on Friday to give a more definite signal. Assuming the recent trendline breakdowns hold, the next price target I’m watching is the support zones that were created at the lows of the early-2018 sell-off. If those supports eventually give way, even further bearish action is very likely.